A cocaine addicted prostitute makes the worst mistake of her life when she hitches a ride with a sadistic trucker who utilizes her as the main piece in his twisted, perverted game. Every so often, a film comes along that is so difficult to review that often times it is best just to bypass any formal review and allow viewers to make up their own minds regarding its worth. The Bunny Game is this type of film because, much like A Serbian Film and The Human Centipede 2, its subject matter, imagery, and style will undoubtedly be extremely divisive. 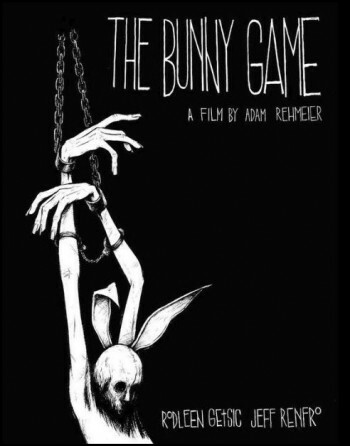 Already banned in the UK for its graphic and unflinching depiction of torture and depravity, The Bunny Game has garnered a lot of buzz among the horror community by those questioning if the content of the film is truly that bad. Well, the simple answer is no, it really is not. This is not to say that the main character is not subjected to some truly grueling treatment that is difficult to watch at times, but the film never crosses the line that one would expect it to based on some of the reactions it has received. Shot in crisp black and white, there is no doubt that director Adam Rehmeier is gifted with a truly unique filmmaking style who has a great future in filmmaking; his at times disorienting camera work coincides with the lead character’s drug induced frenzied mental state. The result is jarring to the viewer, but aids in allowing us into the mind of young woman so heavily addicted to drugs that it consumes her every thought, her every move. This is the appropriate time to mention Rodleen Getsic’s performance. Simply put, she is amazing. She acts with every muscle of her body and very few actresses would go to the lengths Getsic does to create her character She is so authentic, organic, and engrossing that it gives the film a voyeuristic quality generally not easily obtainable with these types of films. Unfortunately, this leads directly to one of the biggest problems with the film. Getsic's performance towers above the material. 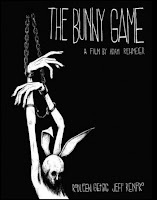 The Bunny Game had severe potential to be a highly effective, unsettling, and downright unforgettable film had the director embraced Getsic's devotion--and Renfro's for that matter--and focused on the situational storytelling that the film begs for. Instead, he spends too much time and effort creating avant garde drenched scenes utilizing dizzying flashbacks, confusing imagery, and seemingly pointless, albeit beautifully shot, scenes. While stylistically impressive, these scenes do nothing to drive the plot forward; flashbacks illustrating the antagonist's past victims are unnecessary simply because it is blatantly obvious what type of warped and twisted person he is by his interaction with our heroine and these scenes do not offer any further insight into his motivation or character beyond the one-dimensional villain he is painted to be. Had these elements been toned down even just a tad and the focus shifted to telling the story of Getsic's character's ordeal at the hands of her sadistic captor, the film could have worked as intriguing look at the dark side of addiction and its potential for allowing oneself to be thrusted into dangerous situations. Additionally, despite the horror of the situation, there is an interesting dynamic between villain and victim that is never fully as explored or developed as it could have been. Unfortunately, this lack of focus allows the film to ultimately become tiresome and uninteresting. In fact, about one half of the film could easily be cut with no major effect on the final product and actually this is a film that would have worked much better as a short, also allowing the rather anti-climatic ending to the film less frustrating. Not all is lost though. The Bunny Game contains some truly terrifying imagery. The cinematography is gorgeous and the isolated desert setting provides a few unsettling segments. The game itself, which consists of the victim having a leather bunny mask placed over her head while the crazed trucker chases her around the desert in a mask of his own sounds corny, but is actually rather disturbing to witness. And certainly the film deserves a massive amount of praise for easily setting itself apart from other film's in the genre. It looks and feels like nothing that has been seen in quite some time. However, once can't help to feel like ultimately, is a prime example of style over substance. This is where assigning a grade becomes tricky: on one hand, the film is truly a piece of art and for that it gets major kudos. On the other hand, it lacks a clear purpose and engaging story, which are crucial elements for the casual movie goer. The preference of the viewer will dictate whether the love the film or hate it, but there is no doubt that had there been a better balance between the two, The Bunny Game could have been one of the best horror films of the last few years. the film you see is the film that was created with the energy of me, rodleen and jeff. there is no towering above the material by rodleen. she is the material. the filming process was as subjective as the viewing process. of course, this is my opinion. we didn't make the film to please the casual movie goer, this is a personal project that was void of script. it was made intuitively, with a tone more akin to improvisational music than to the trappings of the cinema. rodleen's screams and guttural sounds were considered the lead instrument. the soundtrack is accompaniment for her voice.